Maeklong Railway Market - 美功铁路市场 is no stranger to a lot of people. Travelogues featured on different TV channels, including the popular Pornsak's popular travelogue show Rail Trail - 铁路次文化 has also featured on this place, displaying how this busy market operates, in the middle of a railway track. How amazing the robust market is situated in the middle of a railway line. I was motivated to make a trip to visit this place and in the midst of doing research on it, chanced upon a blog post that suggested that I could visit Maeklong Railway, together with the Amphawa Floating Market, as these two places are both situated in the Samut Songkram Province, and pretty near to each other. Killing two birds with one stone was definitely an added point for us make the visit. So, we made arrangements to rent a car with driver, (who turned out to be our driver guide as well), for the day's trip. On our way, I spotted this bridge and manage to snap a quick shot. In less than two hours, we reached Maeklong Railway Market. The market is about 70km from Bangkok city, but with the horrendous traffic in Bangkok, we were lucky that to reach the destination in 1.5hours. When we arrived, our driver guide whizzed us through some market street, that seems like a maze to us, before getting to the Maeklong Railway Station. We arrived at the Maeklong Railway Station to check out the train schedule. The train pass through the market 8 times a day. We were told that the train schedule timings do change, and at times, not too punctual. As there is a little time before the next train arrives at 2.30pm, we venture through the streets. Here are some interesting sights. Man selling a huge pancake-like biscuit. Oh boy, I missed these old-school cakes! I can't resist a photo of the huge durians. Stalls set up just on the side of the railway tracks. Notice the boy is walking on the railway track. Notice the tourists standing by, ready with their cameras, while the locals are still happily doing their marketing. Alright, the train is finally passing by (it was 10 minutes late), and you start to see some slow but steady action from the stall holders. Notice the stall holders holding back the poles of the tentage, just like a manual canvas retractable. The train approaches the market in a slow and steady speed and at times, sounding horns to tourists who were just too eager to capture a good shot of the approaching train. In the midst of the commotion, I couldn't get a good shot of the approaching train. Only heads with their camera aiming on the train. What a waste! After the train passed the market stalls, life continues on. You see the stallholders occupying the railway tracks, almost immediately. Stall holder putting up the shade to continue her business. After that, all the tourists heading towards station to have a photo opportunity with the train. As we are walking back to our vehicle, we spotted more street stalls. A titbits stall where my peers stopped by for some buys. 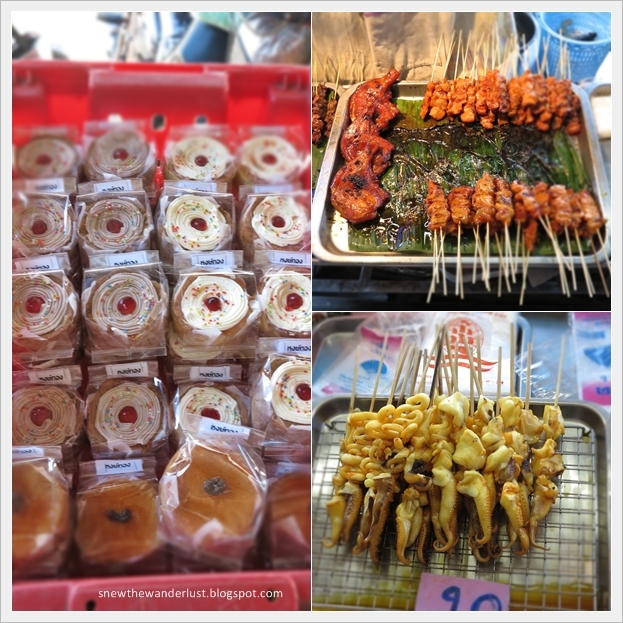 There is a reason why Maeklong Railway Market is one of the most photographed venues in Thailand. It is a unique market, in the middle of an outskirt town, with trains running through it throughout the day. Definitely a sight, and an experience, not to be missed. We paid about S$110 for a 10-hour trip, with the comfort of a vehicle and driver, at disposable for us. We started the journey at 12noon, and visited both the Maeklong Railway Market and Amphawa Floating Market. By the time we reached our hotel, it was about 9.30pm. We share the costs among the 4 of us, hence it was a still pretty affordable full day trip. Another way to reach the Maeklong Railway Market, is to be on the train itself! Check out the blog post by Nomadic Notes on the directions. This is a cheap alternative, but you probably need a full day as it involves two train journeys and a ferry journey. Do plan your time and directions carefully if you do choose to this DIY way.